Documenting the Amalgamated/Park Reservoir community through the faces of its residents was to look at the makeup of what was once a predominately Jewish neighborhood as it transformed into what it is today,a melting pot. As the neighborhood population transitions, the underlying nature and structure of this cooperative set up by the early pioneers 85 years ago, has remained the same. My plan was to take portraits of co-operators, then create diptychs of individuals of different ethnic or cultural backgrounds. I took over 60 photographs, including couples and small family groupings. The diptychs were used to underscore and parallel how diverse people and families live within the unique community that makes up our neighborhood. I decided to concentrate on the people rather than the architectural surroundings, which I felt would have taken away from the focus on the of co-op members as neighbors and mirror images, despite their great diversity. I was able to make 23 diptychs (46 portraits) and 8 individual portraits. 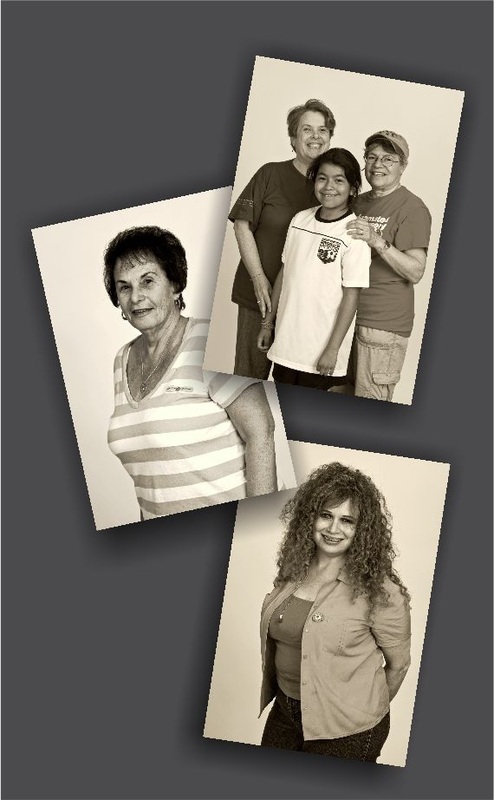 The individual portraits were chosen to stand alone because they are important in telling the story of the community. Looking at the series as a whole, I see one large extended family that is a microcosm for the entire Amalgamated community. It was not possible to photograph all the varied ethnic and family structures in the neighborhood, but I feel that the neighborhood is a true melting pot and that its Jewish roots have played an important role in achieving this. We are also a naturally aging community and we see that in the portraits. As well, ingle parents, single gender parents, and mixed racial families that were rarely seen in the neighborhood during its early years are now accepted and embraced. While the number of children today is much less than what there were when I was growing up here, they are an important part of the successful continuation of our community. I am a second - generation cooperator whose mother was an original pioneer and I would have no problem if my children should decide to remain here. We came from labor unionists, socialists, and philosophers and we are now professors, civil servants, artists, blue collar workers, financiers,unemployed, retirees, and individuals with challenges. It is like many other neighborhoods in the city, but it has a unique, and long term tradition of cooperating, educating, and being involved in activities in the community to foster it as a neighborhood, not just a living space. It may not be the perfect system and it is difficult to entice younger members of the community to get involved because of the many distractions that exist today, but I feel the community does a good job in educating and offering opportunities. I hope that this photo exhibit and accompanying video documentary helps bring the community closer together. To those who are interested in community building, I believe Amalgamated can serve as a successful model of a healthy, diverse and liveable community.